For many that find themselves in a hospital following an injury or illness, the next step to recovery is choosing a rehabilitation center. The choices are many, but only a few offer the advanced technological state-of-the-art equipment and professional services as one of our highly reputable communities. Our rehabilitation centers offer skilled and experienced therapists that are dedicated to achieving specific goals, optimizing current functional levels and maintaining healthy fulfilling lifestyles. The equipment we use to treat patients has been selected specifically because of their patient focus functional outcomes and ease of use. Visit one of our communities, talk to our rehab team and discover why so many people have selected us on their “journey” to living well again. Following are descriptions of the therapists who play the largest role in the care of a post-acute rehabilitation patient. A physical therapist will assist in developing, maintaining and restoring optimal physical function, independence and quality of life. They will also help to correct strength and balance issues that have made it difficult to function at home and in the community. The goal is to restore normal movement and function while attempting to resolve problems such as pain, muscle weakness, loss of motion or lack of coordination. An occupational therapist will help in evaluating and increasing the ability to perform activities of daily living (ADLs) such as dressing, bathing, grooming, meal preparation, and medicine management along with other independent living skills. 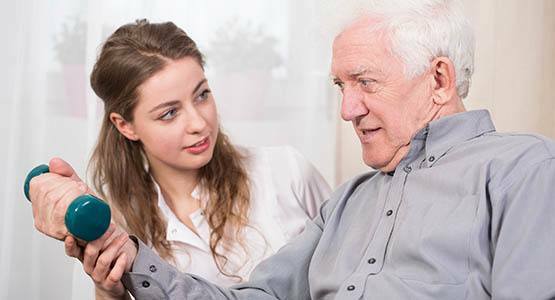 A speech language pathologist will assess and remediate speech, language, cognitive and swallowing difficulties. He/she will develop a plan aimed at increasing one’s ability to communicate and help deal with any issues related to swallowing deficits, including tube feed weaning.